So this evening I rode New Light again. For me, this is one of the toughest mountain bike trails in my local area. There are plenty of things to frighten me about it - grueling root tangled climbs, sketchy descents, rock-littered off camber stretches, intimidating looking log crossings and tight switchback turns. Since our ride took place after work and I wasn't sure how long it would take me to get through the trail, I only did some of the loops, for a total of just under seven miles of the nearly ten mile total out there. 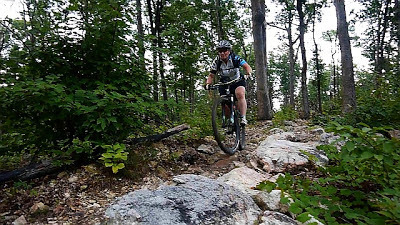 Due to the difficult terrain - as well as the time required for me to dismount and walk over the really scary parts - it had previously taken me nearly 24 minutes just to get through First Loop. That is, until this evening, when I had my best time yet at just over 21 minutes - and that included the time it took to dismount, look at, and then clean, two of the log crossings that had mocked me and scared me out of trying them on prior occasions! Feeling my confidence rising, I even managed to gather up the courage to try some of the rocky creek crossings and a few other logs for the first time tonight as well, and cleaned those too. Lake Downfall proved extremely challenging for me, but I was able to get through some sections I had not made previously, so I felt quite happy about that. 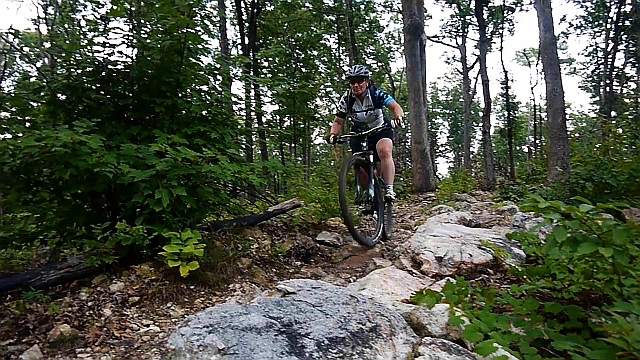 And I rode a decent pace, for me anyway, on Sig's Loop and even got through almost all of Razor Ridge without dabbing (need to work on my confidence on that segment for sure), although there are still several log and rock crossings I haven't quite mastered yet. I suspect they look worse than they actually ride, so I plan to try and tackle them gradually during the next few months. Finishing out my ride, I had my fastest time yet on Easy Street at three and a half minutes. I managed to stay just ahead of John through that loop (actually I think more likely he let me stay ahead of him), but he easily passed me once we popped out onto the fire road and after pushing so hard through the trail, I simply wasn't able to catch him on that final climb. All in all, it was a good day in the woods, and ever so gradually I'm getting more comfortable facing the challenges of my nemesis, New Light. 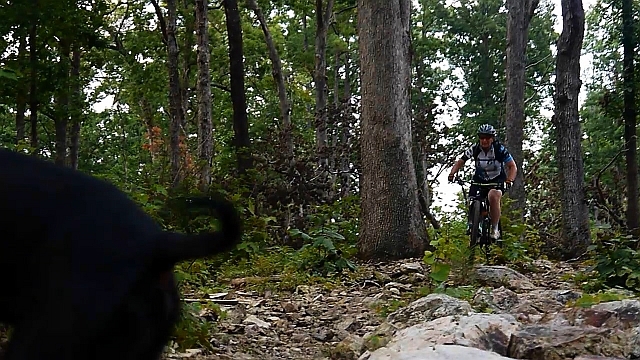 She is a tough teacher with relentless terrain, but every time I face her, I feel she makes me a better rider.